create jobs in the private sector. the journey towards energy independence. President Obama told Al Arabiya in his Interview as President: “My job is to communicate to the American people that the Muslim world is filled with extraordinary people who simply want to live their lives and see their children live better lives. 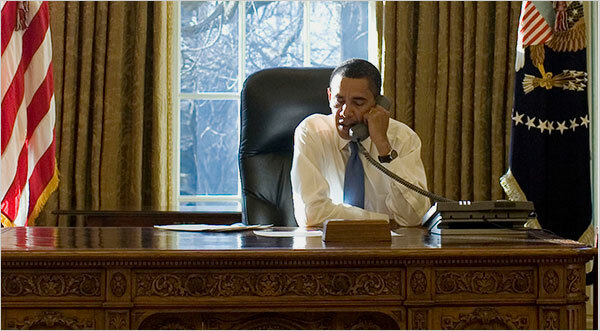 My job to the Muslim world is to communicate that the Americans are not your enemy…. REMARKS BY THE PRESIDENT AFTER MEETING WITH HOUSE REPUBLICAN CAUCUS Ohio Clock Corridor, U.S. Capitol: Hello, everybody. We had a very constructive meeting with the House members, members of the Republican Caucus. I’m a little bit late for my Senate colleagues — former Senate colleagues. And the main message I have is that the statistics every day underscore the urgency of the economic situation. The American people expect action. They want us to put together a recovery package that puts people back to work, that creates investments that assure our long-term energy independence, an effective health care system, an education system that works; they want our infrastructure rebuilt, and they want it done wisely, so that we’re not wasting taxpayer money. As I explained to the Republican House Caucus, and I’ll explain to my former Senate colleagues, the recovery package that we have proposed and is moving its way through Congress is just one leg in a multi-legged stool. We’re still going to have to have much better financial regulation, we’ve got to get credit flowing again, we’re going to have to deal with the troubled assets that many banks are still carrying and that make the — that have locked up the credit system. Peniel Joseph “Week of Symbolism, History in Washington”: “This is an enormous weight that has been lifted from the nation’s psyche. And it does not mean that racism is over, but the notion that there were still barriers for a black person or a person of color to ascend to the nation’s highest political post is now left behind us,” said Peniel Joseph, a professor of Afro-American studies at Brandeis University in Massachusetts and a guest on VOA’s Press Conference USA program. Gil Troy “President Obama the Liberal Nationalist”: Shrewdly, pragmatically, constructively, Obama wants to channel this energy into a badly needed sense of communal renewal. His campaign slogan was “Yes We Can,” not “Yes I Can.” He is continuing the initiative he began with his lyrical, extraordinary 2004 Democratic National Convention speech, trying to articulate a vision of liberal American nationalism that works for the 21st century. 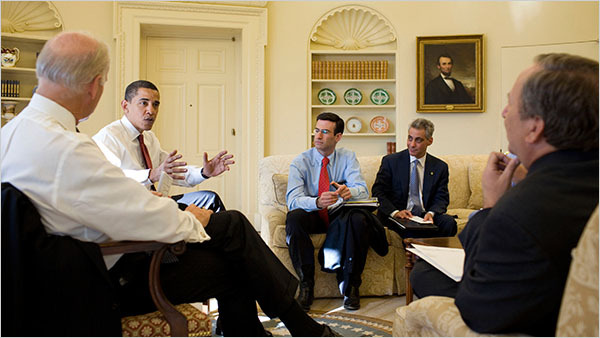 Obama’s repudiation in 2004 of the “red America” versus “blue America” division, his inaugural celebration of “our patchwork heritage” as a “strength not a weakness,” seeks to forge a new nationalist center that heals America’s wounds, and revives a sense of community…..
President Obama in a meeting last week in the Oval Office, where his predecessor required a coat and tie at all times. 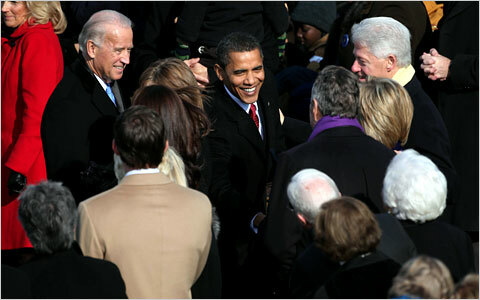 On January 19, 2009, then President-elect Obama joined a huge crowd at the Lincoln Memorial for a national free broadcast concert featuring some of music’s biggest stars. 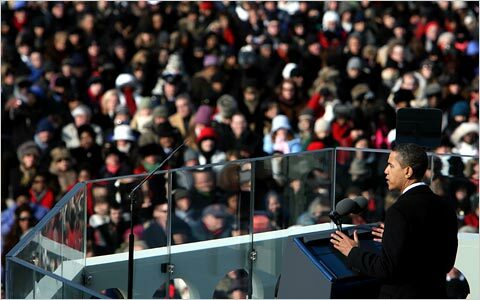 Inaugural Weekend kicked-off with President Obama’s whistle stop train tour from Philadelphia to Washington, DC. 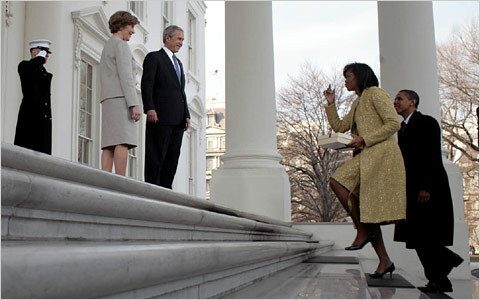 I thank President Bush for his service to our nation…… as well as the generosity and cooperation he has shown throughout this transition. That we are in the midst of crisis is now well understood. Our nation is at war against a far-reaching network of violence and hatred. Our economy is badly weakened, a consequence of greed and irresponsibility on the part of some but also our collective failure to make hard choices and prepare the nation for a new age…. Rather, it has been the risk-takers, the doers, the makers of things — some celebrated, but more often men and women obscure in their labor — who have carried us up the long, rugged path towards prosperity and freedom…. All this we can do. All this we will do…. The question we ask today is not whether our government is too big or too small, but whether it works, hether it helps families find jobs at a decent wage, care they can afford, a retirement that is dignified. Where the answer is yes, we intend to move forward. Where the answer is no, programs will end…. We are the keepers of this legacy, guided by these principles once more, we can meet those new threats that demand even greater effort, even greater cooperation and understanding between nations. We’ll begin to responsibly leave Iraq to its people and forge a hard- earned peace in Afghanistan…. For we know that our patchwork heritage is a strength, not a weakness. We are a nation of Christians and Muslims, Jews and Hindus, and nonbelievers. We are shaped by every language and culture, drawn from every end of this Earth. And because we have tasted the bitter swill of civil war and segregation and emerged from that dark chapter stronger and more united, we cannot help but believe that the old hatreds shall someday pass; that the lines of tribe shall soon dissolve; that as the world grows smaller, our common humanity shall reveal itself; and that America must play its role in ushering in a new era of peace…. For as much as government can do and must do, it is ultimately the faith and determination of the American people upon which this nation relies…. In the year of America’s birth, in the coldest of months, a small band of patriots huddled by nine campfires on the shores of an icy river. 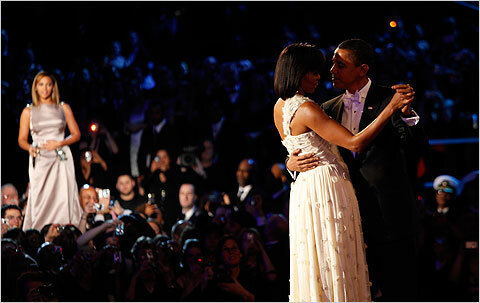 President Obama Inaugural Balls Comments: Today was your day. Today was a day that represented all your efforts, all your faith, all your confidence in what’s possible in America. They said it couldn’t be done. And you did it…. There is something in the spirit of the American people that insists on recreating this country when we get a little bit off course. That’s what powered this election, it’s what’s given our team the kind of energy that has allowed us to overcome extraordinary obstacles and given me so much confidence that our better days are ahead…. That this is not the end, this is the beginning…. When you look at the history of this campaign, what started out as an improbable journey, where nobody gave us a chance, was carried forward by, was inspired by, was driven by, was energized by young people all across America…. I can’t tell you how many people have come up to Michelle and myself and said, ‘You know, I was kind of skeptical, but then my daughter, she wouldn’t budge, she just told me I needed to vote for Obama.’ Or, ‘Suddenly I saw my son, he was out volunteering and knocking on doors and traveling and getting involved like never before.’ And so new generations inspired previous generations, and that’s how change happens in America. And as this is broadcast all around the world. We know that young people everywhere are in the process of imagining something different than what has come before. Where there is war, they imagine peace. Where there is hunger, they imagine people being able to feed themselves. Where there is disease, they imagine a public health system that works for everybody. Where there is bigotry, they imagine togetherness. The future will be in your hands if you are able to sustain the kind of energy and focus that you showed on this campaign. I promise you that America will get stronger and more united, more prosperous, more secure — you are going to make it happen, and Michelle and I thank you from the bottom of our hearts…. George W. Bush Homecoming Speech in Midland, TX: “I always felt it was important to tackle the tough issues today and not try to them on to future presidents, and future generations. I never took an opinion poll to tell me what to think. And I’m coming home with my head held high and a sense of accomplishment. There were some good days and there were some tough days but every day was an honor to be your president. I gave it my all. Listen. Sometimes what I did wasn’t popular, but that’s okay, I always did what I thought was right…. Popularity is as fleeting as the Texas wind; character and conscious are as sturdy as our oaks. History will be the judge of my decisions, but when I walked out of the Oval Office this morning, I left with the same values that I took to Washington eight years ago. And when I get home tonight and look in the mirror, I’m not going to regret what I see — except maybe some gray hair…. In the morning, he said, he would make his wife coffee, “skim” the newspaper, call some friends, read a book, feed the dogs, go fishing, take a walk and by that time it will be 8 in the morning. “That’s what happens when you’re a type A personality. I told Laura I was excited about her cooking again — kinda. She told me she was excited about me mowing the lawn and taking out the trash –- it’s my new domestic agenda. I’m the first former president to be able to share the post-presidency with both my parents. Bush Says Decisions in Office Kept America Safe From Attack: President Bush says in his farewell address that he is “filled with gratitude,” and that the inauguration of President-elect Barack Obama represents a “moment of hope and pride” for the country. Fellow citizens, for eight years, it has been my honor to serve as your president. The first decade of this new century has been a period of consequence, a time set apart. Tonight, with a thankful heart, I have asked for a final opportunity to share some thoughts on the journey we have traveled together and the future of our nation…. Tonight, I am filled with gratitude to Vice President Cheney and members of the administration; to Laura, who brought joy to this house and love to my life; to our wonderful daughters, Barbara and Jenna; to my parents, whose examples have provided strength for a lifetime. And above all, I thank the American people for the trust you have given me. I thank you for the prayers that have lifted my spirits. And I thank you for the countless acts of courage, generosity and grace that I have witnessed these past eight years. This evening, my thoughts return to the first night I addressed you from this house, September 11, 2001. That morning, terrorists took nearly 3,000 lives in the worst attack on America since Pearl Harbor…. Over the past seven years, a new Department of Homeland Security has been created. The military, the intelligence community, and the FBI have been transformed. Our nation is equipped with new tools to monitor the terrorists’ movements, freeze their finances, and break up their plots…. There is legitimate debate about many of these decisions. But there can be little debate about the results. America has gone more than seven years without another terrorist attack on our soil. This is a tribute to those who toil night and day to keep us safe — law enforcement officers, intelligence analysts, homeland security and diplomatic personnel, and the men and women of the United States Armed Forces. Our nation is blessed to have citizens who volunteer to defend us in this time of danger. I have cherished meeting these selfless patriots and their families. And America owes you a debt of gratitude. And to all our men and women in uniform listening tonight: There has been no higher honor than serving as your Commander-in-Chief…. ….In the 21st century, security and prosperity at home depend on the expansion of liberty abroad. If America does not lead the cause of freedom, that cause will not be led. I have confidence in the promise of America because I know the character of our people. This is a nation that inspires immigrants to risk everything for the dream of freedom. This is a nation where citizens show calm in times of danger, and compassion in the face of suffering. We see examples of America’s character all around us…. Cheney Mocks Biden, Defends Rumsfeld in ‘FOX News Sunday’ Interview: In one of his last interviews before leaving Washington, D.C., Vice President Cheney, a 40-year veteran of Washington politics, tried to straighten out a few misconceptions about his tenure and the way the executive and legislative branches are supposed to work. He also said that all the powers and responsibilities of the executive branch are laid out in Article I of the Constitution. Well, they’re not. Article I of the Constitution is the one on the legislative branch. Joe’s been chairman of the Judiciary Committee, a member of the Judiciary Committee in the Senate for 36 years, teaches constitutional law back in Delaware, and can’t keep straight which article of the Constitution provides for the legislature and which provides for the executive. So I think I’d write that off as campaign rhetoric. I don’t take it seriously. If he wants to diminish the office of the vice president, that’s obviously his cal. President-elect Obama will decide what he wants in a vice president and apparently, from the way they’re talking about it, he does not expect him to have as consequential a role as I have had during my time…. The president of the United States now for 50 years is followed at all times, 24 hours a day, by a military aide carrying a football that contains the nuclear codes that he would use and be authorized to use in the event of a nuclear attack on the United States. He could launch the kind of devastating attack the world has never seen. He doesn’t have to check with anybody. He doesn’t have to call the Congress. He doesn’t have to check with the courts. He has that authority because of the nature of the world we live in. I did disagree with the decision. The president doesn’t always take my advice. Julian Zelizer “Obama speech draws on past inaugurations”: “I think the message he wanted to convey was to give a sober, serious, laundry-list, speech. The point was the campaign is over and it’s time to work,” Princeton University presidential historian Julian Zelizer said. “He spoke about trying to find which government programs worked and which didn’t, to overcome old divisions,” he said, noting Obama’s use of a biblical line from Corinthians to urge the nation “to set aside childish things”. ELLEN FITZPATRICK, University of New Hampshire “Obama Claims Presidency, Cites Challenges Ahead”: The suddenness of it I think is striking in one sense, and yet one could argue that it took our entire history to get us to the place that we are today, that is, we crossed the threshold of American history today. 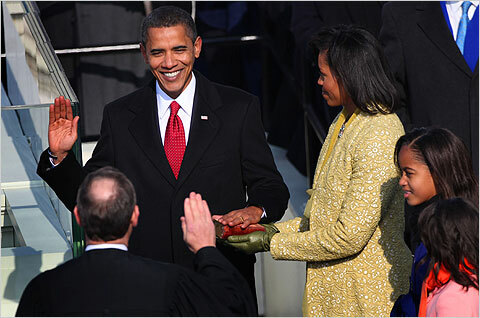 This was truly a historic moment in electing and inaugurating our first African-American president. And I think the day was very rich in history. And the people on the mall came because they were conscious of that and moved by it. You could feel it and see it in the crowd. I think it’s actually — I dissent a little bit, I think, from the sentiment that’s shaping up and to say that I think it was an extraordinarily powerful speech. And the pageantry and that element that Richard just mentioned was surely there, but embedded in it was a critique that we have strayed far from our founding. He asked us to choose our better history, and it was an unvarnished view of American history that he offered. There was that phrase, “We have tasted the bitter swill of civil war and segregation, but we’ve triumphed over these tragedies and the hatred of our past.” And so, in that sense, he was seizing the historic occasion of his inauguration and using it as a way to call Americans back to their origins. And there was a critique here of where we’ve been. He said, “We don’t have to choose between our safety and our ideals.” That, to me, was a reference to the abrogation, or so he would argue, I would say, from those ideals through the war on terror. So it was a very powerful cry to remake America by drawing on our fundamental historical values. PENIEL JOSEPH, Brandeis University “Obama Claims Presidency, Cites Challenges Ahead”: Well, in terms of historically, there’s very few days that actually transform the aesthetics of our democracy. The memory that this day invokes the most is probably the march on Washington, August 28, 1963. Forty-five years and five months ago, Martin Luther King, Jr., came to the Lincoln Memorial with really an expansive vision of American democracy. In that speech, King talked about the previous 100 years, especially the civil war, slavery. In this speech, the president-elect really — or the president really elegantly evoked race. He didn’t make race the central point of his speech, but he acknowledged the notion of slavery, the notion of Jim Crow segregation, and the notion that his father actually couldn’t have been seated at a restaurant 45 years ago. Well, three speeches come to mind. One, FDR’s first inauguration in 1933, where he really had an expansive critique of capitalism sort of run amok. In 1941, FDR has a speech where he talks about democracy and uses the word democracy about two dozen times in his inaugural address and basically makes the argument that democracy will not die because the spirit and faith of American people won’t let it die. And the final one is John F. Kennedy, Kennedy’s speech about a new generation of Americans and a new generation taking the leadership. Obama’s speech really evokes all of that, but the twist is really the iconography. I think one of the reasons why some of the commentators are saying that the speech was only good and not great is because the pageantry, like Richard talked about and Ellen talked about, is really overwhelming all of us. But when you really read the speech — and I’m not sure this crowd got the substantive nature of this speech — the speech substantively matches the overwhelming symbolism of the day. RICHARD BROOKHISER, National Review “Obama Claims Presidency, Cites Challenges Ahead”: Well, no, you can’t, but I was struck today by the kind of pageant of confirmation that this whole day was. And there have been some of those in the American past, where people sort of collectively get together and say, “Yes, we like this. 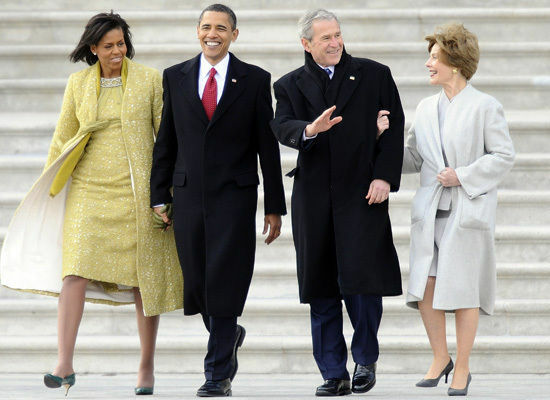 This is good.” Washington’s First Inaugural was like that. The government was new. The Constitution was new. The great war hero was coming back to lead it. You know, he went from Mount Vernon to New York. It was like a six-day triumphal progress. And then the numbers were much smaller, but in terms of percentage of population, it was maybe equal or even greater to the turnout we had today. But it was just like a collective embracing of the moment and saying, “We’re happy to be here.” And I got a feeling of that watching this day as it unfolded. Well, it was, but, you know, history always gives people surprises. Now, eight years ago, George W. Bush was coming in, and he did not imagine he was going to be fighting two wars. I mean, no one would have. And there was a foreign policy component of this speech. He did mention that. He made the points that you touched on. He also addressed our enemies and said, “We will defeat you.” But, you know, the enemies will have the freedom of action, also. And they will try and pick and choose their battles. And now all those phone calls are coming to our new president, many of which we will never hear about, but, you know, the killers are out there. They’re still after us. Now there’s a new commander- in-chief who will have to deal with them. Bush endures stormy present, counting on history’s judgment: George W. Bush leaves office on Jan. 20 as one of the most vilified presidents in American history. Battered by an unpopular war and an economic collapse, Bush has racked up the longest streak of negative job-approval ratings in the history of polling. His end-of-term scores are worse than any modern president except Richard Nixon, who resigned in disgrace…. Evan Thomas – An Interview with Barack Obama: NEWSWEEK: Going back to the period where you were deciding whether to run or not, I’m very curious about what you wanted to hear when you sat around with your friends and advisers. What were you looking for in terms of what you hoped to hear from them? Barack Obama: Well, the first question was, could I win? And I think that’s something that I needed to get some very objective assessments of, because one of the things that I’ve always been suspicious of is the hype that surrounded my entry into the U.S. Senate. I wanted to make sure that we hadn’t fallen prey to hype and believing our own press, so I wanted to test in very concrete terms and push very hard on the question of whether we could win. 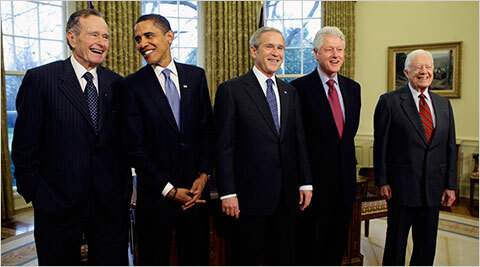 Since we assumed that we had a strong field, including Sen. Clinton and John Edwards. The second question, which had more to do with conversations between Michelle and myself on which we needed some feedback from the staff who had been through a presidential election, was how it would have an impact on our family. And that actually was the most important question, but unless we crossed the threshold where we could win, the second one became moot, because I had no interest in running if I didn’t think we could win. I wasn’t interested in setting myself up for four years from now because to some degree I was very fortunate; I already had a very high profile. I stood to lose more than gain in a presidential race if I wasn’t successful. So the second question was: how it would affect our family? And then thinking about schedules and workloads and the rhythm of a campaign, the nature of the scrutiny involved, how it would alter our daily round, and how would we, how effectively could we shield our families, our girls? 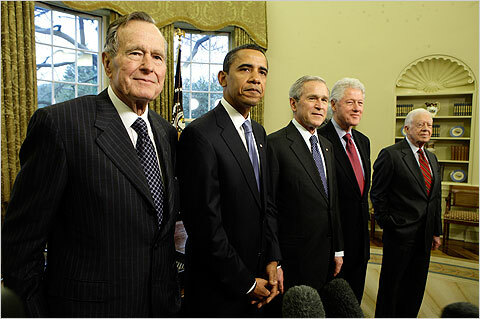 PRESIDENT BUSH: I want to thank the President-elect for joining the ex-Presidents for lunch. And one message that I have and I think we all share is that we want you to succeed. Whether we’re Democrat or Republican, we care deeply about this country. And to the extent we can, we look forward to sharing our experiences with you. All of us who have served in this office understand that the office transcends the individual. And we wish you all the very best. And so does the country. PRESIDENT-ELECT OBAMA: Thank you. I just want to thank the President for hosting us. This is an extraordinary gathering. All the gentlemen here understand both the pressures and possibilities of this office. And for me to have the opportunity to get advice, good counsel and fellowship with these individuals is extraordinary. And I’m very grateful to all of them. But, again, thank you, Mr. President, for hosting us. Lincoln wanted the strongest, most able leaders in the country working with him, Goodwin said. Though he had no pro-slavery voices in his circle of advisers, he had a “great range of opinions” about how to handle slavery, she said. Eric Rauchway “Obama’s challenge From the economy to war, this president faces crises unimagined since Abraham Lincoln or Franklin Delano Roosevelt”: Obama does not inherit a 25 percent unemployment rate, as Roosevelt did at his first inauguration, arriving as it did at the nadir of the Great Depression. Half of those who had jobs in 1933 were working only part time, said Eric Rauchway, professor of history at the University of California-Davis and director of the Center for History, Society and Culture. Rauchway sees no big effect of the 24-hour news cycle — “people who want news get news, whether in 1933 or now” — but he does see a parallel in the way Roosevelt and Obama delivered their messages to the American people.